Victorians will never get to see the economic rationale for the state’s most expensive transport project, with the Napthine government ruling out public release of the business case for the controversial east-west road tunnel, even after contracts are let. Treasurer Michael O’Brien confirmed that the business case for the $6 billion to $8 billion tollway to link the Eastern Freeway and CityLink, will never be made public, citing commercial sensitivity. Secrecy around the business case for the east-west public-private partnership has fuelled concern about the reasoning for a project that the government has struggled to justify. It is also at odds with a call last year by former Kennett government minister Mark Birrell for the release of business cases for PPPs in light of the financial collapse of toll tunnels in Brisbane and Sydney. Mr Birrell is now the head of private infrastructure lobby Infrastructure Partnerships Australia. The Coalition has released a scant and detail-light summary of the business case. 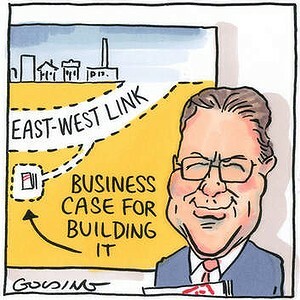 In comparison, more information is emerging on the benefit of Melbourne Metro – the major rail infrastructure project sidelined by east-west – and of a ”West Link” road. A report prepared last year for the Council of Australian Governments found Melbourne Metro would boost productivity by almost $400 million. The advice to COAG’s reform council says the rail project would improve travel times, reshape employment opportunities and ”significantly” mitigate disadvantage in Melbourne’s west by giving people more access to work. The Coalition was elected on a public transport platform promising to build new rail including the $9 billion Metro tunnel, and new rail lines to Doncaster, Rowville and Tullamarine airport. But inquiries by The Sunday Age have found that, in government, the Coalition had a dramatic change of heart within weeks. And by November 2011, the then Baillieu administration’s top transport priority was the east-west tunnel. Rail projects such as the Melbourne Metro had been pushed back or, in the case of Doncaster rail, effectively abandoned. The Sunday Age has spoken to senior bureaucrats, consultants and politicians close to the behind-the-scenes deliberations that took place in 2011. Three factors appear key to the government’s elevation of the east-west tunnel above promised projects: money, politics and the make-up of the Victorian bureaucracy. In March 2011, the Linking Melbourne Authority, which oversees major road projects, recommended a freeway through the western suburbs to ease the clogged West Gate Bridge. Like the Metro tunnel, West Link was part of the Brumby government’s transport plan. Both had been backed, ahead of the east-west option, by transport supremo Sir Rod Eddington, who in 2008 could find a maximum benefit of 75¢ in the dollar from an east-west tunnel. The Napthine business case found $1.40. The authority advised Mr Mulder that West Link could be completed well ahead of an east-west option, and provide a ”crucial alternative Maribyrnong River crossing”. But the government sent the authority away to begin work on an east-west tunnel instead. its attention to the Eastern Freeway bottleneck at Hoddle Street, Clifton Hill. Even Liberal elders acknowledge that basic electoral politics was a factor. Labor had turned west in its transport planning. The Liberals, east. An electoral map of Melbourne reveals the Liberals’ heavy reliance on state seats clustered to the direct east of Clifton Hill. Federal Liberal leader Tony Abbott recognised this with his surprise pledge in 2012 of $1.5 billion for the east-west tunnel. Mobile billboards saying ”Only the Liberal Party Will Build the East West Link” have been seen in the marginal east suburban Deakin electorate in recent days. A financial expert in government at the time of the east-west decision told Fairfax Media it appeared to be ”about looking after marginal seats”, a view shared by a government infrastructure planner who said: ”The constituent interest of the Coalition lay with servicing the eastern and northern suburbs. That is ultimately why West Link was not given a real hearing, albeit it was ready to go”. For a government maligned as ”do nothing”, there was the political advantage in ”latching on” – as one source describes it – to a project that could start before the 2014 election. Premier Denis Napthine has promised that work will begin next year. But votes weren’t the only numbers that mattered. To a government committed to surpluses and low debt, but facing a softening state economy, a publicly funded $9 billion Metro tunnel was daunting. Insiders across government agree the east-west scheme had the advantage of being cheaper than the Metro or West Link and also able to generate toll revenue. Use of a public-private partnership to build the link would help keep costs off the government balance sheet. The east-west link would generate more toll revenue than the freight-focused West Link because more cars would use it. ”It was a decision between funding and long-term economic benefit,” said an insider heavily involved at the time. And while big rail projects sound good in opposition, they tend to have few champions within the bureaucracy. That is not the case with roads. Road builder VicRoads is renowned as a formidable advocate for its own cause. The Linking Melbourne Authority was established to deliver big one-off road projects like Peninsula Link and, now, the east-west project. The authority needs large road projects to justify its existence. It pressed hard for a new cross-city road; western suburbs did not matter. But while the east-west project made short-term political, financial and bureaucratic sense, questions remain about its transport merits over rail and West Link. The government has spruiked east-west as a ”congestion-buster” but has not said why it is so superior to the projects sidelined to make way for it. This month Dr Napthine told ABC radio that 80-100,000 vehicles a day would use the tollway. VicRoads estimates 140,000 cars a day currently use the Eastern Freeway. On those figures, as much as 70 per cent of current Eastern Freeway traffic is heading west rather than into the city. But research suggests most traffic is heading south into the city area. The government figures could point to the expectation of a big rise in traffic on the Eastern Freeway resulting from the new link. An increase in cars on the freeway would undermine the ”congestion busting” claims. Transport Minister Terry Mulder stood by the government decision, pointing to the traffic snarls where the Eastern Freeway meets Hoddle Street. ”There is a freeway that comes to an end; its bizarre,” Mr Mulder said. He said that once in government he championed the east-west link because of the need for an alternative to the M1, stressing that an accident or glitch in CityLink computer systems could ”stop Melbourne”. ”This is a legacy project that we’re going to leave behind as a government because it’s going to make a massive difference,” he said.